There is Background Intelligent Transfer Service (BITS) present in every Windows XP/2003/Vista setup. BITS manages Windows Updates downloads, but is also capable of transfering other files. More on BITS can be found here. Since the infrastructure is there, I wrote a lightweight application, which manages the user queue of the BITS service. You can download the installer or a ZIP version. If you grab the ZIP, you should change the installation path inside the .html file for the IE integration to work properly. 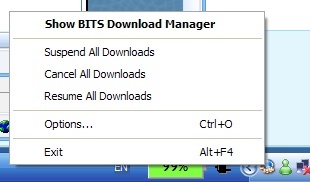 BITS Download Manager will quitely sit in your system tray and wait for you to give it something to download. 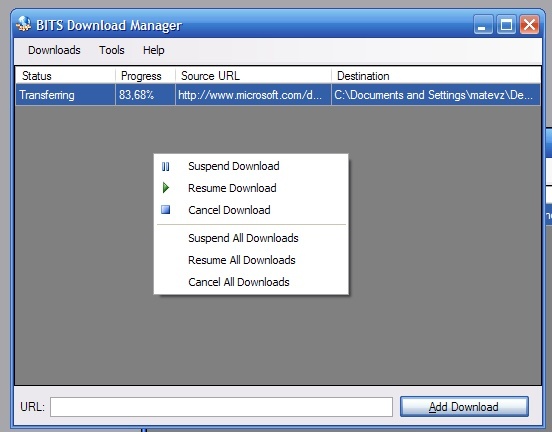 When you initiate the download, it will progress in the background only if there is enough bandwidth available. I use it to download large files over HTTP, being from my own server of those damn Windows SDK 1GB downloads which seem to break every now and then. Minor bugs fixed regarding appropriate single instancing when launching a download from IE. Context menus fixed when no downloads are in progress. You do not need to uninstall version 1.0.0 before installing this one. Minor bugs fixes, Windows Vista support.